Please see "Optional Fees" section for additional services and options available and include all items needed in your Quote Request to me along with number of occupants, tow vehicle being used, destination and number of nights requested. Your tow vehicle MUST have a 7-Way Trailer Plug and Electric Brake Controller installed to control the trailer's Electric Brakes before the trailer will be released into the renters possession. If you need the trailer delivered, set up and picked up, we can provide this service for an additional fee. Cargo Carrying Capacity 2,842 lbs. -This 2019, 35 ft, bumper-pull Travel Trailer is light weight (6,817 lbs dry) Please check your vehicle's weight and hitch capacity. It sleeps 8 and has one "Super Slide" slide out that opens up the main quarters. 4 Point Sway Bar Hitch included at no additional cost that helps stabilize the trailer while pulling. -10ft Garage - The back bedroom easily sleeps 4 (even more kids) but If you want to bring motorcycles or 4 wheelers with you, the back room converts to a 10ft garage with built in tie-downs. Just raise up the electric bunk bed to the ceiling, tuck away the fold-up sofa sleepers and you are in business! This trailer can be used as wither a Toy Hauler or a Travel Trailer! We provide pots, pans, dishes, utensils, a Keurig (you supply K-Cups), toilet paper and cleaning supplies for the camper. You bring pillows and blankets. It also comes with camping chairs, 2 folding tables and a propane fire pit (you supply the propane). Most places have a wood fire ban but may will allow propane fires. Generator and/or Propane available under "Optional Fees". If you are camping at a site with electric hookups, you wont need the generator but either electric hookups or a generator are required to run the AC, TV/DVD and microwave (Home Depot Charges $75+ per day for a generator). Only the lights, stereo, USB Ports, Awning, water pump and Slide Out will run from the battery. The refrigerator can run off of both electricity or propane. The stove, hot water heater and furnace run off of propane. Renter must have a valid Driver's License and active Auto Insurance. A copy of each will be required before trailer will be released. Credit Cards used for payment must be in the renter’s name. Renter is responsible for ensuring the vehicle use to pull the trailer is adequately equipped to support the weight of the trailer. Your tow vehicle MUST have a 7-Way Trailer Plug and Electric Brake Controller installed to control the trailers electric brakes before the trailer will be released into the renters possession. If you need the trailer delivered, set up and picked up, we can provide this service for an additional fee. Do not use awning when wind is present. The awning and its mechanical parts are fragile. Repair costs are the renters responsibility. Absolutely no smoking in the trailer. Other renters may be sensitive to smoke or have asthma. A $500 smoke removal fee will be deducted from renters deposit if trailer has been smoked in while in the renters possession. Renter is liable for the cost of repairs for damages incurred to the trailer (interior and exterior), the items in the trailer and the generator while in the renters possession. The trailer must be returned in the condition is was received. This includes dumping and cleaning black and grey tanks, unit cleaned, swept and mopped (cleaning supplies provided) and no trash or personal items left behind. We will wash provided sheets. A $250 cleaning fee will be deducted from the renter's deposit if this rule is not adhered to. Do not access or walk on the roof. It is not designed to support a person and it will be damaged. The renters deposit will be used to cover the insurance deductible in the event of an accident, collision, damage or act of God. Class , 30 ft long. Perfect for your outdoor adventure! Sleeps 6-8, depending on your crew. Included in your rental is a CO State Pass (good for entrance into 42 Colorado State Parks), 2 chairs with side table, bbq grill, pots and pans, 2 bath towels, bedding for the main bedroom, extra sleeping bags, DVD’s, and family friendly games. We love our camper trailer and know you will too! It's our second home and has all linens, toilet paper, cooking utensils, pots, plates, cups, included. ****Comes with a full water tank, empty black & gray tanks as well as two full propane tanks - ready to roll! (See fee section) Additional water, propane or dumping is your responsibility while rented. 2860 lbs dry, 5600 lbs gvwr. Can be towed by a small truck or large suv (check your owners manual). Water hookups & 30amp electric for RV site usage. Want to be "off grid"??? We have an external dual fuel (gas / propane) generator available for an additional fee, this will need to be hauled in back of truck, does not fit in RV - it's also heavy! From October 1 - April 20th the trailer is Winterized and will not have water/plumbing. 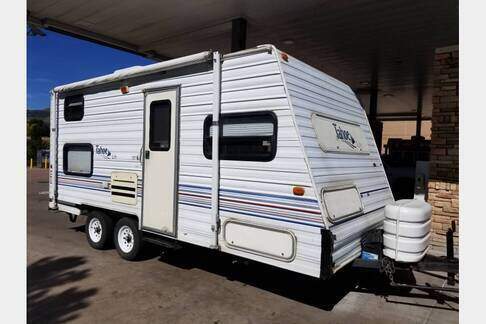 This 5th wheel is spacious with front living space and 4 slide outs. 2 fold out queen sleeper sofas in the living room and a queen bed in the bedroom. Plenty of storage with outdoor camp table and chairs. Two 30# propane tanks and 2 deep cycle batteries enable long-term dry camping. 2K Generator available on request. This trailer is very light for a 38 foot fifth wheel and pulls very easy. If you have a B&W turnover ball I also have the B&W companion hitch that is a simple adapt for the bed of your truck. I can also (prefer) to deliver/pickup to your campsite or location within a reasonable distance from the Colorado Springs/Denver area. Immaculate condition! Call me before booking (Ted) at 480-227-1302. THis is a brand new travel trailer, 2018. I pulls behind my LN Town car easily and if yo have a truck it will be easy to pull too, V-8 Recommend. The total weight is 5600 lbs dry weight and only can have 800 lbs of personal things and this includes Gas water etc. It has all the features, outside shower if you are at the beach, and oven, Stove, Frig. ,freezer. 4 ft bath tub and shower, with toilet next to it. Very nice new I only used it once. Renters consistently rate this vehicle as excellent. A great choice for groups of 2 to 4 travelers. This vehicle is from a private owner. Are you looking to hike at the foot of the Rockies? A Campanda RV rental in Colorado Springs isis just what you need and offers the most opportunities to explore for hikers and nature watchers alike. With a growing fleet of 25 thousand RVs, Campanda is the largest and most trusted platform for renting RVs world-wide. It’s better not even to look at motels in the middle of scenic Colorado. You’ll step right into the wild as soon as you park your RV rental in Colorado Springs. Easily a capital for everything outdoors, Colorado Springs offers some of the best trails for hiking and natural wonders for sight seeing. It also has home municipality status, which means that it’s a self governing entity, so you’ll feel the place’s uniqueness not only in its biological features but also in its legislation. Here are some of the destinations that you have to visit after getting an RV rental in Colorado Springs from Campanda. Garden of the gods draws its name from a unique formation of sand stones that inch up the ground in a diagonal fashion. You’ll find beautiful sandy structures poking behind the trees and foliage. A trail connecting Palmer lake and Fountain, CO runs through the city. This trail is part of a network of trails that stretch over 110 miles. Your RV rental in Colorado Springs can become a hub to venture from in multiple directions. So park next to all the other RVs and take some time to hike and explore. the city offers also some of the best vegetarian delicacies in Colorado. In fact it’s a city known for cooking a mean plate of vegetables. It has a wide diverse selection of earthy foods because of its location at the base of Pikes Peak giving it access to a wide range of elevations for some good old fashioned local collection of foods. Garden of the gods RV resort is a great option to hook up your rig because you’ll be right in the heart of Colorado Spring’s main attractions. The prices are a little bit on the more on the expensive side, but it’s worth every penny. Goldfield RV parks offers probably the most diverse range of services. They have different pricing plans to support all types of budgets. Your RV rental in Colorado Springs will be parked in a park known for its serene vibe and friendly staff. Foot of the Rockies RV resort and Storage is the most competitive on price and is set up on a huge piece of land. Ironically enough, it’s the furthest one among the three from the Rockies. 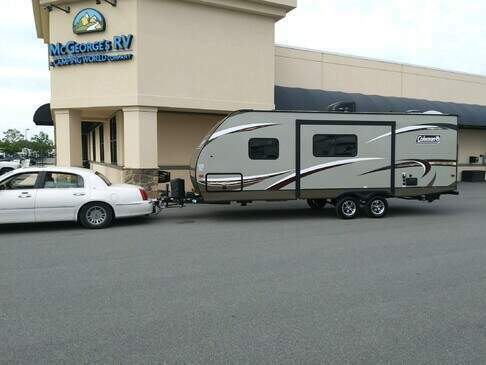 All RVs are not created equal. At Campanda we only accept the best performing and the most unique of vehicles to become part of our 25 thousand strong global fleet. 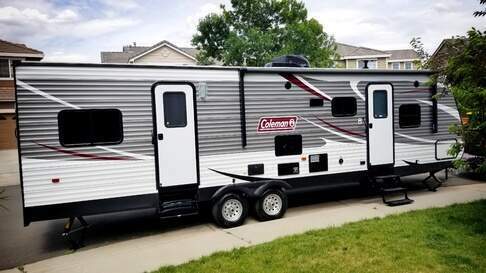 When you choose Campanda for your RV rental in Colorado Springs, you choose excellence in service, reputable experience and a commitment to doing things the right way. Renting an RV can be a headache. With our platform, you can limit your search to find exactly the motorhome you are looking for. Without leaving our website, you can compare the different RVs you can rent in different cities. The old days of comparing local dealers are gone. We operate with most dealers and compare their offers directly in one page, so you have the different offers at your fingertips. 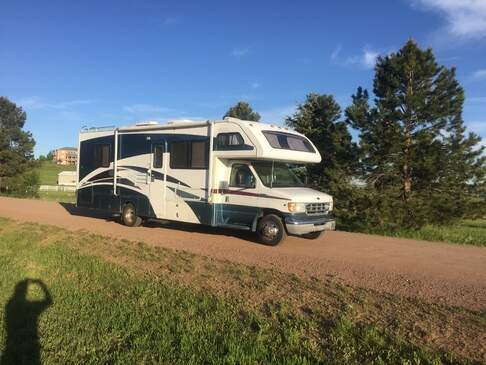 You can find your optimal RV rental in Colorado Springs by filtering the number of passengers, type of RV, amenities such as A/C, electric capacity, pet acceptance policy etc..
Of course you don’t have to rent a motorized cabin. 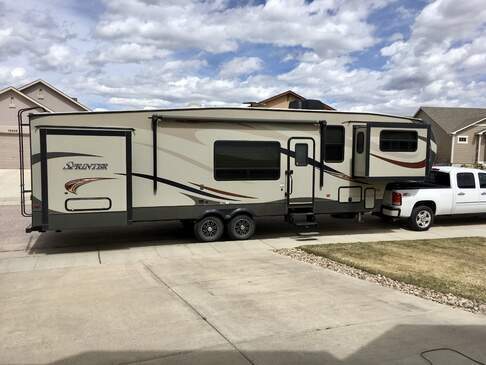 A trailer or 5th wheel is also a great option for people looking for Colorado Springs RV rentals. Just hook up your newly rented trailer to your truck or SUV and start driving, the trailer will get hauled behind you and no one will be the wiser. This way you enjoy the extra cabin space and drive the vehicle you are used to. Additionally you’ll typically save around 25% of the cost that you would otherwise need to book a C Class RV rental in Colorado Springs. Every year we attract more and more satisfied customers and lessors to our platform. Our customer service representatives are happy to answer your questions prior to booking your rental in Colorado. But it doesn’t stop there. When you run into troubles on the road, they are also more than happy to oblige. Whether it’s trouble with the electrical converter or finding the closest gas station in Colorado Springs, our specialized customer service professionals help dozens of clients each day to have a better camping experience. So browse our RV rentals Colorado Springs and join the community and the Campanda family. You can also check out our RVs in Denver, Fort Collins and the state of Colorado.